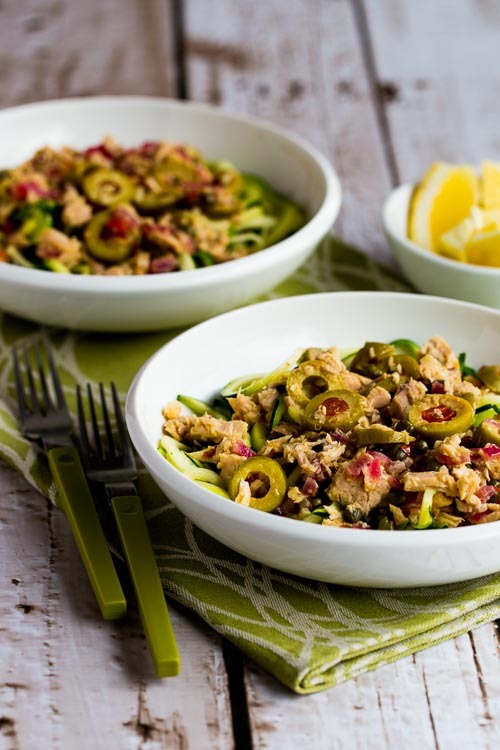 Get some zucchini and try these Low-Carb Zucchini Noodles with Tuna and Green Olives, yum! This tasty zucchini noodle dish is low-carb, Keto, low-glycemic, gluten-free, Paleo and Whole 30; use the Diet-Type Index to find more recipes like this one. 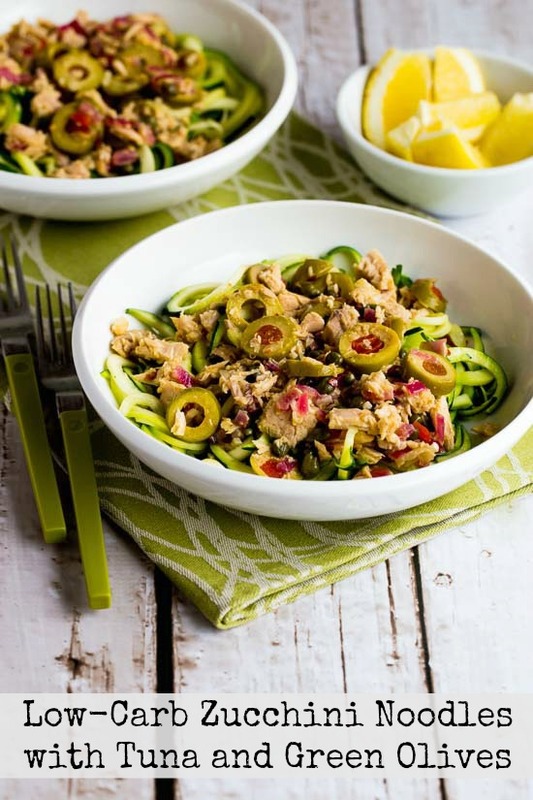 Click here to PIN Low-Carb Zucchini Noodles with Tuna and Green Olives! Zucchini noodle season is coming, and personally I couldn’t be happier about it. Ever since I discovered the Spiralizer last summer I’ve had fun experimenting with different ways to make zucchini noodles taste amazing. Low-Carb Zucchini Noodles with Tuna and Green Olives were born out of my love for Tonno Genova canned tuna in olive oil, something I’ve been buying from Amazon.com since I stopped finding it in my local stores. Yes, that’s seriously how much I love this tuna. The flavors here were inspired by my Tuna Pasta Salad with Lemon, Green Olives, and Cucumbers, something I’ve made many times since I created the recipe. Of course if you absolutely don’t like tuna or green olives this recipe is not for you, but if you like those two things just a little, be open minded about this wonderful combination. Zucchini noodles can be eaten raw, but when I’m serving them with a heated sauce like this one I like to heat some olive oil, season the oil with sliced garlic (which is then removed) and then cook the zucchini quickly over high heat for just a few minutes. I think that method perfectly softens and seasons the zucchini, but you can also eat the tuna sauce over raw zucchini if you prefer. 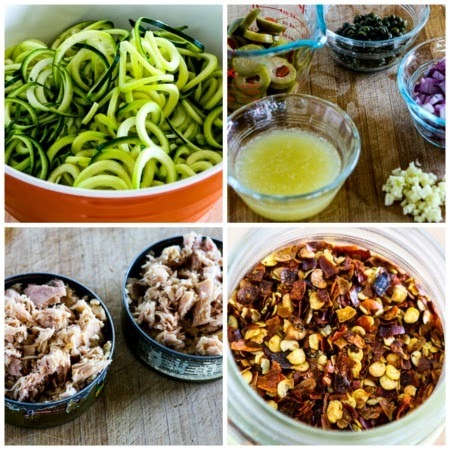 Edit: Low-Carb Zucchini Noodles with Tuna and Green Olives was featured in the Top Ten New Recipes of 2015 (plus Honorable Mentions). Use one of the three methods to make zucchini noodles to make noodles from 4 medium zucchini. Prepare and/or measure the lemon juice, green olives, capers, red onions, minced garlic, and red pepper flakes. Drain two cans of Tonno Genova canned tuna in olive oil or your favorite good-quality tuna packed in olive oil. Heat 4 tablespoons olive oil and saute the onions for a couple of minutes. Add the garlic, capers, and olives, and cook one minute more. Add the red pepper flakes and stir, add lemon juice and cook another minute, then gently stir in the tuna. Keep warm while you cook the noodles. Heat the rest of the olive oil over medium-high heat; add the garlic cloves and cook just until you can smell garlic; then remove garlic and discard. Add the zucchini noodles and stir-fry just until noodles start to soften and get some garlic flavor, about 2-3 minutes. Season noodles with salt and fresh-ground black pepper. Put the noodles into a wide bowl and top with sauce. Serve with fresh lemon to squeeze on at the table. This tasty zucchini noodle dish is delicious with tuna and green olives. Wash zucchini and cut off both ends. 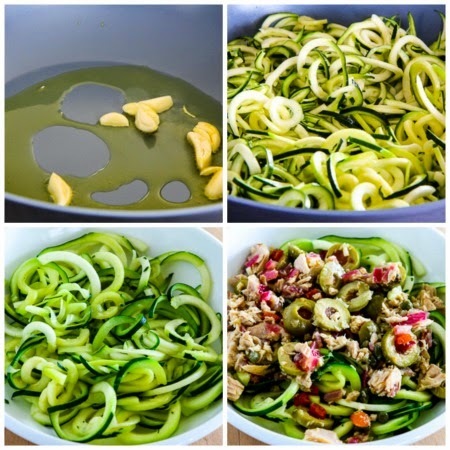 Use a Spiralizer or one of the three methods to make zucchini noodles to make noodles from the zucchini. Mince the garlic, chop red onions, and slice green olives and measure the lemon juice, capers, and red pepper flakes. Drain two cans of tuna, preferably Tonno Genova canned tuna in olive oil. Heat 4 tablespoons of olive oil over medium-high heat and saute the onions for a couple of minutes. Add the garlic, capers, and olives, and cook one minute more. Turn heat to low while you saute the noodles. Heat 1 1/2 tablespoons of olive oil over medium-high heat in the largest non-stick frying pan you have. Add the garlic cloves and cook just until you can smell garlic; then remove garlic cloves and discard. Add the zucchini noodles and stir-fry just until noodles are barely starting to soften and get some garlic flavor, about 2-3 minutes. Season noodles with salt and fresh-ground black pepper. To serve, put one-fourth of the cooked noodles into each bowl and top with one-fourth of the sauce. Serve with fresh lemon to squeeze on at the table. This recipe would be perfect for most any other Low-Carb eating plan as well as any phase of the South Beach Diet. This is awesome. I've used a similar onions/olives/capers/lemon combo on chicken before for Senegalese yassa poulet, but never thought to make a sauce for veggies. You've such a talent with sauces Kalyn – thanks for sharing! So glad you liked it; this is one of my favorite ways to eat tuna! I tried this tonight and was very impressed with how well the zucchini noodles married the tuna/olive/lemon spread. It was also nice making a substantive dish that's composed of whole food! Thanks for the recipe – it'll be a regular for me. Thanks Andrew, so glad you enjoyed it! Zucchini noodles are something I have never tried but they are such a clever and healthy way to eat it! I have to try this. Thalia, hope you enjoy! I'm really becoming a fan of them. Great recipe!! Quick and easy to make and to enjoy on a summers night or for lunch. Can black olives be used? You can certainly use black olives if you're not a green olive fan, although I think the green olive+lemon+tuna combination is really good here. Thanks for your reply. I shall try it with green olives first see how it is. Like you said the combination is really good and sometimes if green olives are in some foods, the taste of other foods in the dish block out the taste of the olives. Yes! I actually have a salad very much like this one packed and ready to eat for lunch today — tuna, zucchini, carrot, and sriracha for zing. The olives are a great idea — so much flavor! Thanks Eileen; glad you like it. Your salad sounds great too! Thanks Dennis; hope you enjoy it. And I hope you love the Spiralizer as much as I do! I was skeptical at first, but it's really becoming one of my favorite gadgets, and I do have quite a few! My spiralizer actually survived the downsizing when The Perfect Pantry moved to the city. Time to get it out of storage and start using it! 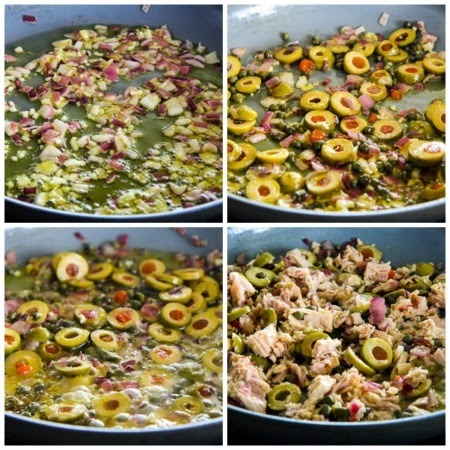 Love the flavors in this recipe, especially the combination of tuna and olives. An Italian cook introduced me to that pairing many years ago. Lydia so glad you kept the Spiralizer! And I love the combo of tuna + olives.